« Got a Heavy Haul to Move? Call Great Western Transportation! 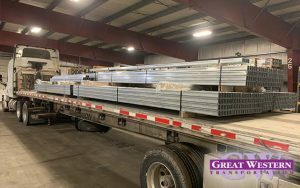 You have a lot of options when it comes to moving your construction materials from source to job site and anywhere in between, and flatbed trucking is often the best of those options. There’s a reason you see so many loads of lumber, steel, scaffolding, and heavy equipment going down the highway on a flatbed! Instead of having to shove everything through a door, a flatbed allows for easy loading—and unloading—from all sides via crane or forklift. There’s also no need for a dock: you can load directly from the ground. For transporting tractors, forklifts, or other equipment, the vehicles can easily be driven up a ramp onto the flatbed. You won’t get stuck hauling a small load on a giant truck. Instead, you can choose the flatbed that’s right for your load. From a basic flatbed with three options for lengths to dropdeck and double dropdeck flatbeds and extendible options that stretch to up to 70 feet long, you’ll be able to choose the flatbed that best suits your needs. Not sure which one will work best? Our trailer selection guide will help you choose, and we’re always available to answer your questions and advise you about regulations and limitations for your loads. Flatbed loads are carefully secured with chains or straps to prevent them from shifting or falling off in transit. The load is safe, and so is everyone around it! If there’s a possibility that the chains/straps themselves could damage the load, it is additionally secured with V-boards to protect against that. Tarps can be used to protect the load from the elements. With more than 100 years of combined trucking experience, our team is proud to offer efficient, professional, and affordable transportation. 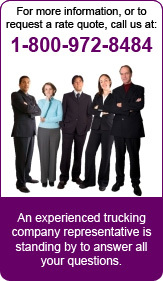 Call us today to learn more about our flatbed trucking services.